ISLAMABAD (Reuters) - Pakistan's economic growth is set to slow to between 3.5-4.0 percent in the 2019 fiscal year from 5.2 percent in 2018, with a fiscal deficit of 6.0-7.0 percent, the State Bank of Pakistan said in its latest quarterly economic report on Monday. The government, which has been holding discussions with the International Monetary Fund over a possible bailout, had been targeting growth of 6.2 percent, but there have been growing expectations among economists of a slowdown. "Real GDP growth during FY19 is likely to moderate significantly, mainly due to slowdown in the growth of the agriculture sector and stabilization measures taken to preserve macroeconomic stability," the central bank said. It said the outlook for manufacturing remained "subdued" given slow public development spending, while private consumption would remain lower due to tighter monetary policy and higher inflation due to exchange rate depreciation. The central bank forecast consumer price inflation running at 6.5-7.5 percent, partly due to the weaker rupee, with energy prices rising significantly. Faced with the prospect of a balance of payments crisis, the government of Prime Minister Imran Khan has stepped up efforts to shore up its foreign exchange reserves and attract more foreign investments. It has secured funding and credit arrangements from Saudi Arabia, the United Arab Emirates and China, some of which have already been booked and some of which is expected in the second half of the year. 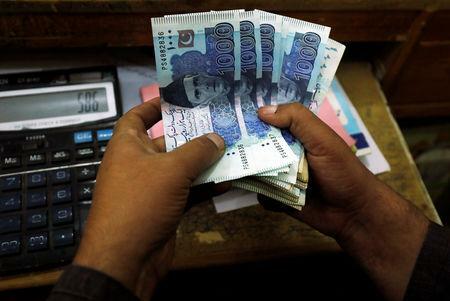 The report noted that the current account deficit in the first seven months improved by $1.7 billion in the first seven months of the fiscal year to June but remained high at $8.4 billion. Earlier this month, the research unit of ratings agency Fitch cut its forecast for growth in the fiscal year to June to 4.4 percent, citing tightening monetary and fiscal conditions. Is Grasim Industries Limited's (NSE:GRASIM) CEO Pay Fair? Is PLDT Inc. (NYSE:PHI) A Good Stock To Buy?